Jikishin Magazine Issue 1 now Available. 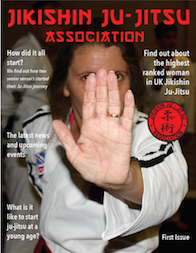 Issue 1 of the new JJJA magazine, edited by Trudi Kitchener. 2016 Kent Course & Competition - Photos FREE! 2015 National Competition - Photos FREE! 2015 National Kata & Random Attacks Competition - Photos FREE! 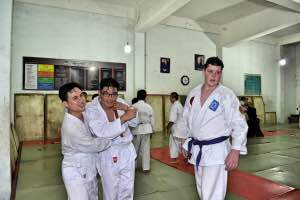 Photographs from the Jikishin 2015 Course & Competition. 2014 National Competition Fighting & Random Attacks - Photos FREE! Photographs from the Jikishin 2014 Competition. 2013 National Course & Competition - Photos FREE! Photographs from the Jikishin 2013 Course & Competition. 2012 C&C Photos Available for FREE! Medal Winner & Photographs from the Jikishin 2010 Course & Competition. Those of you who had their photos taken by the I'm Famous Team at the 2012 Course & Championships can order these here. 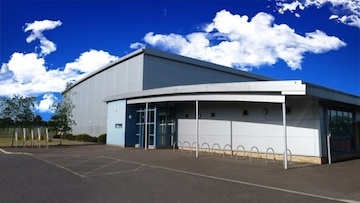 Sensei Herbert has designated the Wednesday Club at East Tilbury as an Instructors Club, in addition to normal training. 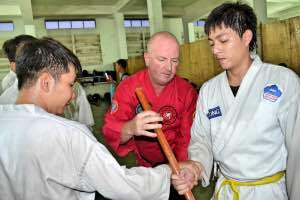 Shihan Stephen Cosgrave of Jikishin Australia is heading to Ho Chi Minh City in visit the brand new member school of Jikishin Ju-Jitsu Vietnam to officiate at their first gradings. 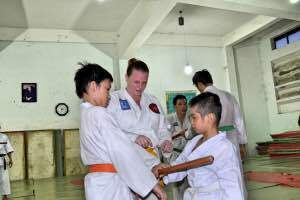 Sensei H Quan Nguyen 3rd Dan (Jikishin recognised grade) has been appointed Head of School in Ho Chi Minh City and from all reports has a fast growing student base. All members are very excited about their upcoming gradings on the 5th May. We will also be holding a multi style martial arts seminar to be held on the 6th May where Shihan Cosgrave will be instructing and providing intensive training on the Jikishin syllabus in Ho Chi Minh at their full time Dojo. We would like to thank and congratulate Quan on this great milestone for his school, and welcome him to the Jikishin family. Sensei Peter McCarney is currently looking into a trip to Vietnam & Australia proposed for 2019 /2020, dates / details / cost to be confirmed. Our first Fighting Championships will take place with new rules for some categories. Starting in January 2017 we are setting up a new structure to the adult Wednesday class at East Tilbury Dojo. This will also allow normal running of the main class but now more in depth personal improvements are available. Lots of you already use the class but this will give more structure to helping training needs or just checking syllabus work etc. This does not take preference to your own club it is merely a support class. For further information, please contact Hanshi Brian Herbert. A fantastic day and evening was experienced by all the students, Instructors and organisers and helpers on the 5th December 2016, at the Tilbury Cruise Terminal, Tilbury, Essex where teams from clubs in the UK, and our great friends from Belgium competed for National and International medals. A very special thank you to Sensei Sarah Bull and Sensei Colin Humbles for the smooth, efficient and effective Organisation. Brilliant job! The course saw Senior UK & International Instructors, up to 9th Dan, demonstrating techniques and teaching on the mats. Competitions were held in Sparring, Ground Fighting, Random Attacks, Open Hand Kata, Weapons Kata & Pairs Demonstrations. With more than 170 competitors, many competing in several events, challenging for medals, with a field of over 400 entries. We saw some great fights and stiff competition at the Championships with both UK and Belgian competitors work very hard for their prizes. For Photos of Courser & Competition and Medal Winners - See sidebar. 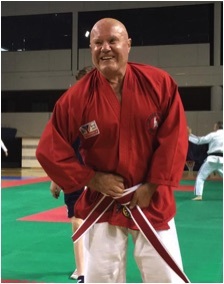 2016 - Hanshi Brian Herbert - Head of Jikishin Ju Jitsu Association & Chairman of the UKMAGB was awarded his 9th Dan (Kudan) at the Euro Budo Random Attacks International Competition held in Taranto, Italy 2016. 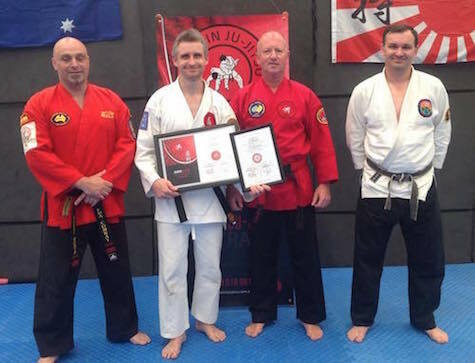 Our congratulations to Hanshi Herbert -who has been practising and teaching Ju Jitsu for more than 35 years - on the award, and on achieving one of the highest grades in the world of Ju Jitsu. The Grade Award was ratified by Association Heads across Europe, and is richly deserved. The Jikishin/UKMAGB Random Attack Team won 2 medals at the prestigious Random Attack Championships held in Taranto, Italy. 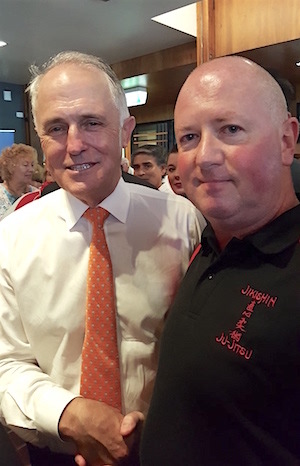 Shihan Cosgrave - 5th Dan recently met with Australian PM Malcolm Turnbull, and was able speak to him about the role of martial arts in the community and how effective it is for children in the prevention of bullying, the growth of confidence, and the education of the public about how to remove oneself from a dangerous situation. The binge drinking culture in Australia reflects what is happening in the UK, and young people being "king hit" or "coward punched”, as it is called in Australia is becoming an community issue and Jikishin are taking steps to educate people from all walks of life how to notice the signs of a bad situation and get out of them without causing injury to themselves or any one else. This has led us to the provision of a scholarship scheme with local businesses who might be in a position to sponsor a child for 12 months worth of classes. The intention is to take this further with local schools who, it is hoped, will propose students they believe would benefit from such an arrangement. The change of location in Queensland has resulted in an increase in students recruited, with 11 already signing up since beginning classes in January. The new website can be found at the Jikishin Australia Website. We have three 7th Dans who help me with the progression of Ju Jitsu and the teaching of instructors as well as students in our association. Master teacher is a Japanese term, often used in Japanese martial arts as an honorific title for expert or senior instructors. The term is frequently used interchangeably with English terms such as "master instructor". Must be 7th Dan and above. Very senior expert considered a "Teacher of teachers". 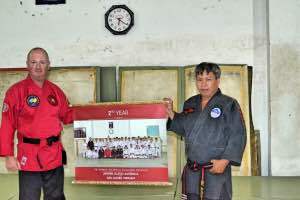 This title is used by many different arts for the top few instructors of that style, and is sometimes translated "Grand Master". The "Han" in Hanshi means "example, model" and indicates "a teacher that can serve as an ideal model for others", or a “senior master”. Hanshi may be awarded to the modern day rank of 8th and above. 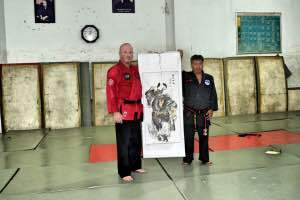 This is a very special title representing the highest levels of martial arts, political involvement as a practitioner, be seen as an innovator, a teacher of and show personal growth an in depth understanding of their relevant style. Hanshi and Shihan use the same letters. With the above in mind, I award the title of Shihan to Ricky Izod, Graham Sargeant and Chris Sheppard. All three regularly attend my senior black class for improvements training, assisting, and also teach senior grades at my club and at their own clubs. Many thanks and have a great Christmas and New Year. The UKMAGB/Jikishin Ju Jitsu Association Dan Gradings were held at East Tilbury on 6th December 2015. 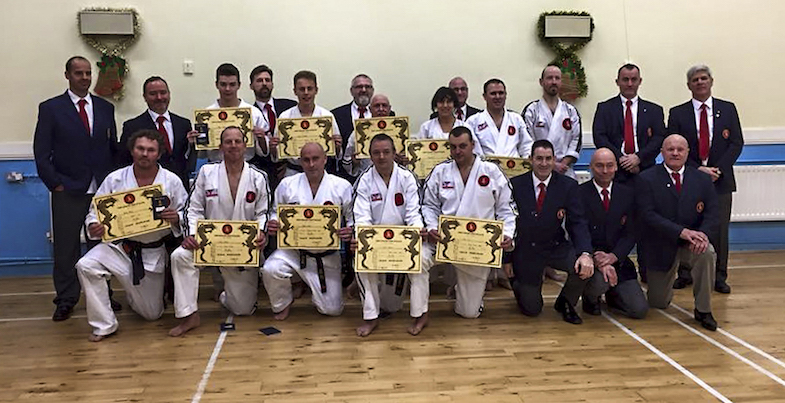 Certificates were presented by Hanshi Brian Herbert at the Jikishin Annual Christmas Ball & Dan Grade Celebration at the prestigious Orsett Hall Hotel, in Essex. 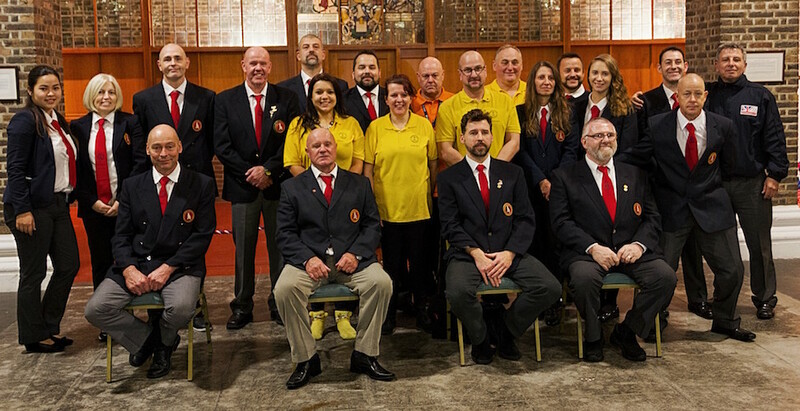 The UKMAGB / Jikishin National Course & Championships were held at a new and prestigious venue at the Great Hall, The London Cruise Terminal, Tilbury. The venue was kindly provided by the Port of London Authority, and is a beautiful location. A huge thank you to the organising team, especially to Sarah Bull and Colin Humbles who worked so very hard to ensure that the event ran so smoothly, and to the many, many volunteers, referees, judges, scribes, dressers, runners and oranisers who helped before the event and on the day. A fantastic job from all. 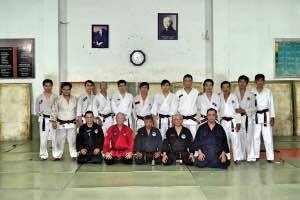 Jikishin Australia travelled to Vietnam for a 2nd time in March 2015 where they were again welcomed by Aiki Jujitsu. Training over 3 nights, techniques including baton and knife defences were shared successfully despite language barriers between the 2 schools, with Shihan Stephen Cosgrave sending 2 of his students, Lachlan Slater and Suzanne Butler into the fray. There is 3rd trip planned for September 2016, and all students from any Jikishin school across the world are welcome to come along for this cultural exchange. The final of 2015 Ko Budo Seminar held on 15th August was well attended, and a number of students passed their weapons respective grades. The new Rapid Knife & Baton Defences were introduced into the syllabus by Hanshi Brian Herbert, 8th Dan. The Rapid Knife Defences were devised by Sensei Ricky Izod, 6th Dan and Sensei Graham Sargeant, 6th Dan. The Rapid Baton Defences were devised by Hanshi Herbert. The introduction of the excellent Rapid Knife & Baton Defences will continue to be taught on subsequent Ko Budo seminars through 2016. 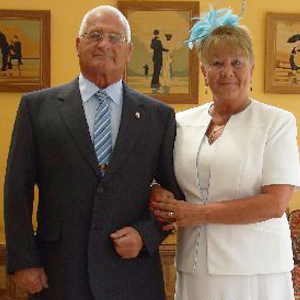 It is with immense regret and sorrow that we have to announce that Janet Parker, wife of Professor Terry Parker and cofounder of the Jikishin Ju Jitsu Association, passed away peacefully at home on Friday 12th December 2014 surrounded by her loving family. Janet had been suffering with lung cancer. Sensei Janet was loved by all who came into contact with her, a caring, loving person with a smile for everyone. Her warm and open personality, along with the fact that she always had time for a chat with anyone, her hard work and dedication to Jikishin was an inspiration to all who knew her. Janet made sure that she knew every Jikishin student and would warmly greet us all without fear or favour. Her memory for names and faces was the stuff of legend, and her enthusiasm, drive and devotion to her husband, children and family, not to mention her Ju Jitsu "family" was never in question. Those who knew Janet well were never bereft of a kind word or gesture when Janet was around, she was always generous with her time, affection and thoughtfulness. Our world is a poorer place without her, but a better place for having had her in it. Janet will never be forgotten. Our thoughts are with her family at this time of enormous sadness. Lyle Marsden was awarded his Black Belt - 1st Dan (Shodan) in an impressive display of his skills. The Grading took place on Saturday 29th November 2014 in Melbourne. 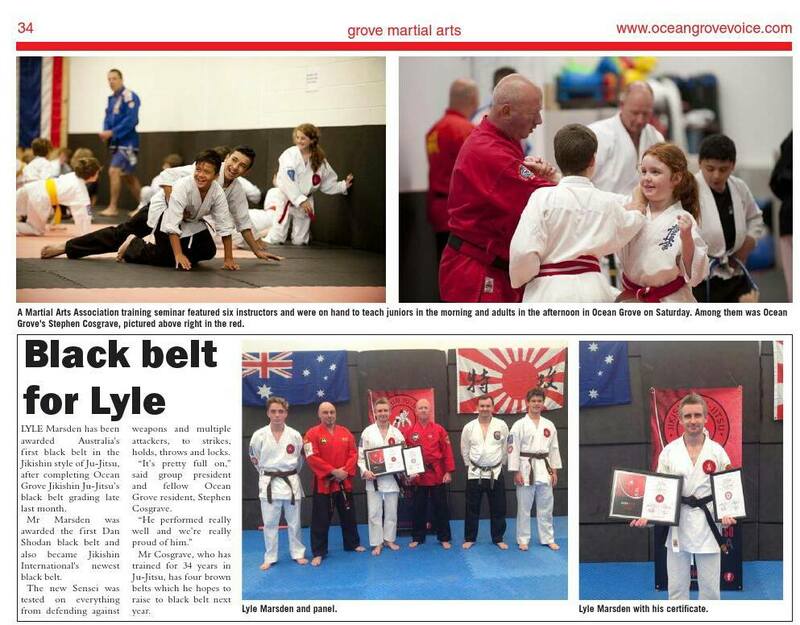 The Grading Panel consisted of Shihan Steve Cosgrave - Head of Jikishin Australia, Marcos Dorta - Australian Ju-Jitsu Federation state Representative for Victoria, and Ross Miller. Left to Right: Marcos Dorta, Lyle Marsden, Steve Cosgrave, Ross Miller. The UKMAGB was proud to hold the EBI Random Attacks 2014 International Competition with representatives from the UK, Belgium, Holland, Spain, Italy & Romania. The UK Team won 7 of the 24 medals available in an exciting and superbly run competition at the fantastic facilities at Loughborough University. 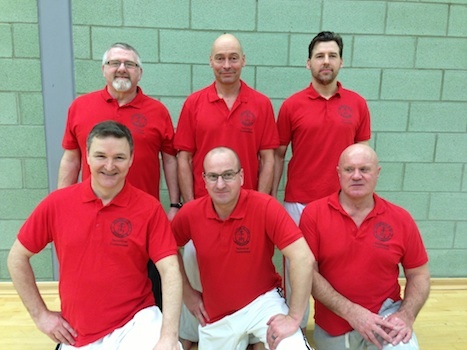 Results, Report by Sensei Peter McCarney & Photographs. Another excellent course held at the Swindon Dojo by Sensei Steve Cole & the Jikishin Senior Senseis. See the report and pictures. The team needs to gain sponsorship to cover the costs of the National Squad going to European Championships being held in Loughborough. If anyone is able to help with this please speak to me on Sunday, or contact me. I have worked out a very rough cost which will cover Gi's, tracksuits, T-shirts, accommodation and travel to Loughborough to be around £300 per person with a full squad including ukis and subs that's 34 people so we need to raise just over £10,000. Some of you have said you may have some contacts. The Euro committee are organising a presentation to give to any potential sponsors, and as soon as I get this I will send out. I am also looking for someone to assist with organising kit for the final squad, if any of you have contacts in this business and who may be prepared to give the team a great deal. please let me know. The Ko Budo (Weapons) seminar was held on Saturday 15th February 2014, at the superbly appointed Olympic venue in Basildon. Run by the Jikishin Technical Committee, the seminar was well attended and hailed a success. Hanshi Brian Herbert, Sensei Colin Humbles & Sensei Simon Powell. 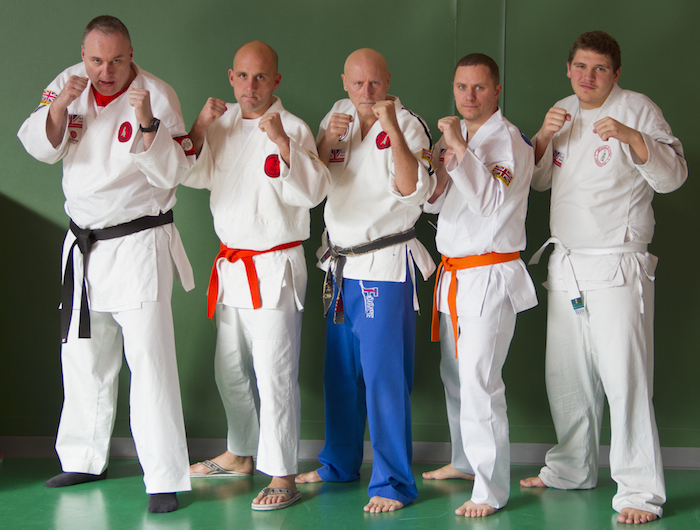 A team of Jikishin Fighters joined others from Germany, Portugal, Spain, Belgium, Italians for the inaugural Euro-Budo Sport Fighting Championships in Madrid, Spain. 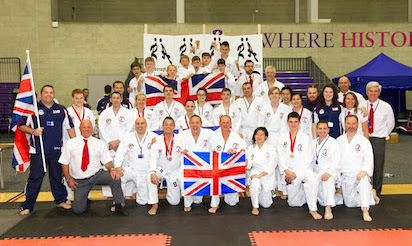 The team was led by National Sport Fighting Coach Earl Walker, and the competitors represented the Team GB with great spirit and determination. Jason Brooks - SOS - (injured and could not compete), Mark Davey - OEL, James Nichols - SOS, and David Mizon - Hando, and accompanied by Tony Mizon & Jackie Walker - Hando. The team did exceptionally well in the circumstances, although no medals were won. The promotion of Sport Fighting is an exciting development within the arena of Sport Ju Jitsu, and is likely to be very interesting to all those who like to compete. We would like to thank our hosts, the Spanish Federation FEJJYDA, and a special thank you to Angel and Rueben who made the international teams so welcome.